On April 14, at 08:55 information was received to “911” service that a grenade was noticed near building 221 of Microshrjan district of Hrazdan town, Kotayk province: the rescuers’ help was needed. The operative group of the fire and rescue squad of the rescue service of MES of RA dispatched to the scene. 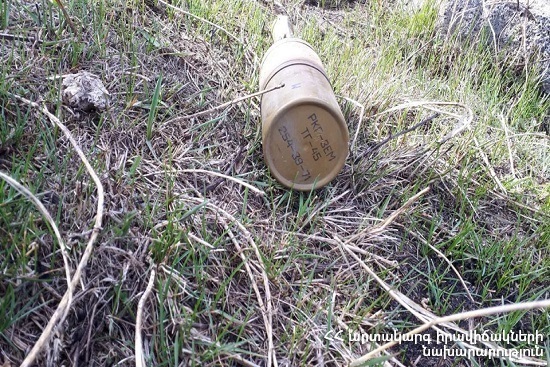 It turned out that a hand-held anti-tank grenade (PKГ-ЗЕМ ТГ-45 254-39-71) was found in the field near building 221 of Microshrjan district. The rescuers blocked off the scene. The police officers of Hrazdan division removed the grenade to a safe area.